I saw the show on Wednesday -- well done! What a fascinating project, and so imaginatively written and staged - not to mention the sound and music! Strong cast, too -- the two sisters are sensational. I loved the progressive interweaving of the different narrative and relational threads, with the final coming-together "dance" and the ending where the lingering questions are answered at last. I thought the Egypt and Belgrade scenes were the strongest -- great emotional currents in the former and fabulous energy in the latter. Last night, I had the privilege of attending the premiere of 'Refugee' at the Curtain Theatre at UMass-Amherst. The cast and crew deserved their standing ovation. The writing, the direction, the acting, the music, the costumes and set, everything came together for a memorable performance. It took a lot of hard work but the young American cast really pulled it off. This is the story of a family, a human story, and also a story about us – and our histories. The power of your story (your mother's) and the way that you told it through those particular characters just dug down into my heart and stretched me. I felt such a connection to each person, who you made so real. The mix of intense drama and occasional humor and music of the place and period, the way the stage reached out to us, and the lighting dramatized each scene, it was truly like the audience was in the story. The stage sets were as genius as any I've ever seen, with the frames and sheets and lights. I also want to thank you for making the women in the play such strong characters. Each one held her own in such hard honest ways. I felt the wholeness of life as I watched, the love and the pain, the hunger for connection and the disappointment…I pray that the story will go further, especially in these troubling times. It was one of the theater highlights in my life. I cried during the performance, it was so moving. I only wish it had more performances, because I've been talking about it to everyone I know. Joe loved it, too! We've been thinking a long while afterward about sense of place and of our grandparents who were immigrants and how we thought their journeys were difficult. But this really brought home the refugee experience and how difficult that was and continues to be, as we see daily in the news. I hope it opens people's hearts to a compassionate response. I wanted to thank you again for an amazing show. Not only was the entire production wonderful, but above all, what struck me the most were the words. The script that you wrote carried people, and changed the world around its audience. The way that you directed the show emphasized the importance of that. I think, sometimes, when we do a piece that rings so true for so many lives and experiences, that there is something soothed in the fabric of time, brought to peace by the telling of a story with such weight and beauty. I think that it is extremely important that this show exists. I truly hope to see it go very far. I genuinely believe that it will. 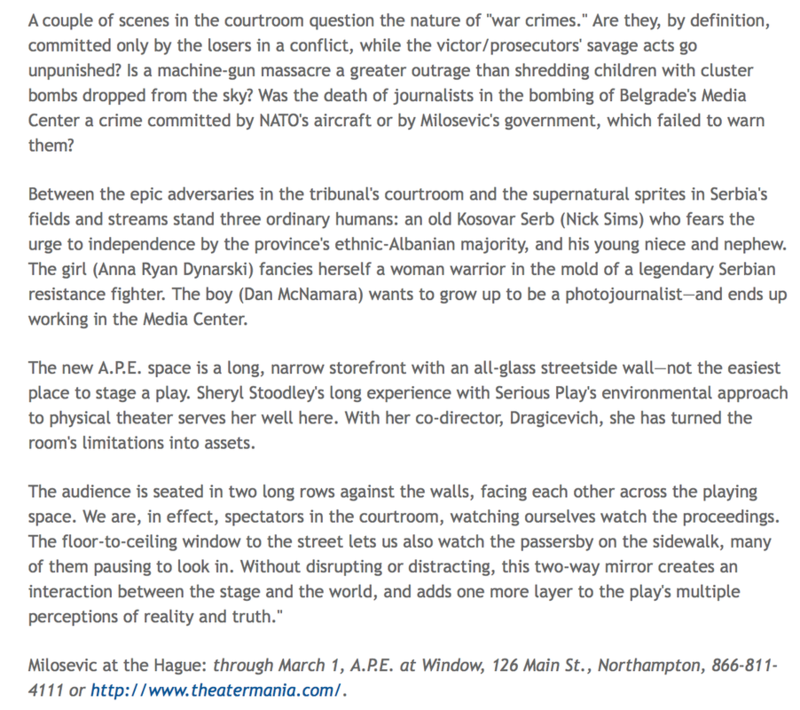 Last night I saw Milan Dargicevich's new play Refugee at the UMass Fine Arts Center. It was brilliant and moving and powerfully acted. I LOVED it. The play brought back so much of his earlier play [ Milosevic at The Hague]. Congratulations Milan!! I imagined both plays being done at The Public in NYC as they are very connected! I think it's sold out for the rest of the run, but it must be done again. Fabulous! I felt indeed privileged to sit in the theater this evening, it was so intimate and personal, I wanted to reach out and hug the characters. I was weeping at the end of your amazing play this evening--it was all so moving, so well-written and performed. I am hopeful for you and your future audiences who need to witness this history and to remember it, that this piece will live on somehow. The music by Tim was perfect--every instrument or piece that was played seemed to be written so closely with the script, one almost did not notice it as music--in a funny way, it was like another character. 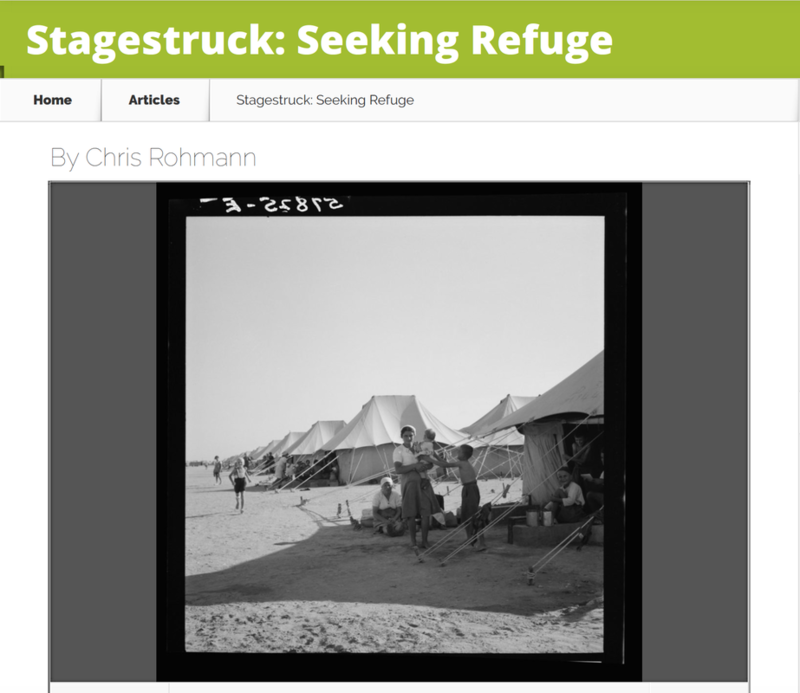 REFUGEE was “total theater.” The kind of theater rarely seen in this area [Boston], and only occasionally matched by productions at the American Repertory Theatre at Harvard (Cambridge). Your theatrical sensibility was well complimented by the almost film-like vision of the director, as well as the production’s composer. I was also impressed with the entire theatrical space, the ambient, design, and of course the performers. Finally, a big bravo to the text itself. You have weaved a stirring and epic narrative with skill and daring, with sharp dramatic action, where the multiple stories “reflect” back upon one another. The production was truly wonderful. 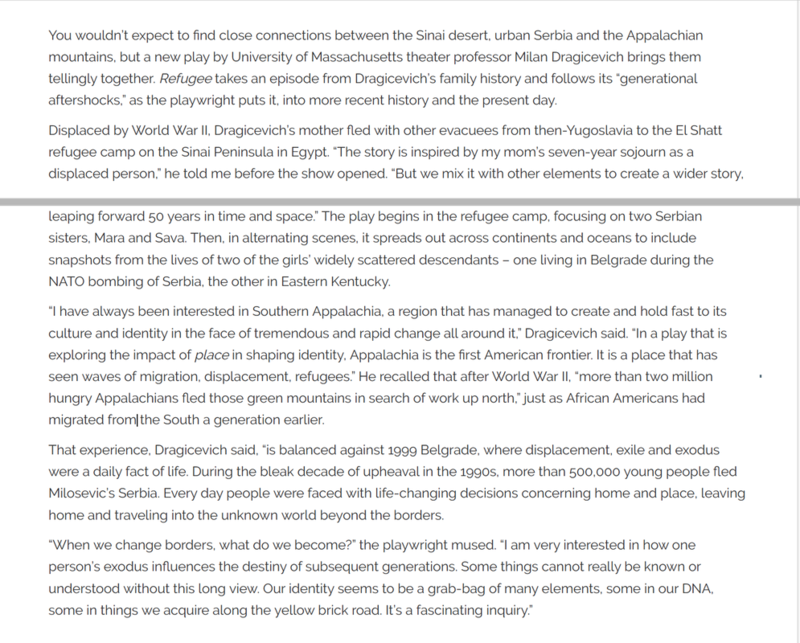 I love how the play connected the refugees from Krajina during World War II with those from the 1990s in Yugoslavia. Also, I really like the parallels with the displaced, impoverished people of Southern Appalachia, and its deep resonance with Serbia. The live music was fantastic.